Media Vision has unveiled its solution for multichannel video-capture, recording, and streaming with multiple audio tracks: Attend Sixteen. 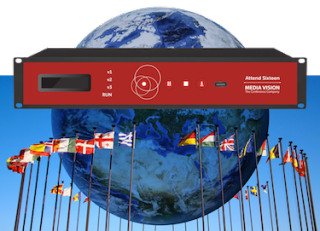 Attend Sixteen can provide up to 16 channels of digital audio on one high-resolution broadcast stream using Dante media networking technology. Up till now, the conventional response to multilingual ‘casting has involved either duplicating video content for each audio channel, or building complex dedicated infrastructures, both engendering high operational costs. “Multilingual technology solutions are often tricky to manage and there was clearly an unmet demand for streaming devices with multiple audio tracks,” said Wesley Sutliff, director of product management at Media Vision. The Attend Sixteen can be used as a standalone streaming and recording device or used in tandem with the Media Server software and integrated with a CDN for large scale implementation. The media server provides a flexible, customizable user interface to fully manage the streaming workflow for live and on-demand video. It is loaded with features that encourage interaction from the viewers and enable sharing across multiple social media sites. For live video deployment, a high level of process automation can be achieved when integrating the Attend Sixteen Device with conference microphone systems. Audio files from conference systems are generally tagged with metadata – such as the delegate’s name or meeting topic – that can be used to add markers to a recorded event. Markers will enhance the users’ online experience, allowing them to jump to a specific section of the recording or share clips. Attend Sixteen was introduced at Integrated Systems Europe. Although it may be a reliable solution for all providers of live and on demand video content, Attend Sixteen is primarily intended for multilingual applications.